How to bulk up fast? While some are constantly trying to lose excess fat, others find it tough to gain weight. Ironically enough, junk food won’t work for those who can’t gain weight. The solution is simple — eat food rich in healthy fats and protein, like milk, avocados, nuts or salmon. Eating the products on our list as a snack, garnish, or the main dish will help you gain weight. And if you combine them with regular exercise, they will help you to build muscle. Bright Side prepared a list of the 19 best foods that are an alternative to boring chicken breasts and incredibly beneficial in helping you on your weight-gaining and muscle-building journey. – One study from the American Journal of Clinical Nutrition proved that drinking skim milk right after a workout also helps build muscle mass more effectively than any soy-protein drink. – Even though store-bought protein shakes are great, too many of them have loads of sugar and almost no nutrients. It’s always better to make your own homemade shakes that’ll give your body all the vitamins it needs to gain weight and muscle. – Avocado is the top dog of healthy fats! It’s super nutritious and has powerful health benefits that can help you on your way to enviable muscle mass. – Red meat has pretty much everything you can ask for when it comes to putting on weight and building muscle. First of all, it contains leucine and creatine, two powerful nutrients for muscle protein stimulation and new tissue formation. – According to the DuPont Nutrition & Health company, the soy protein in tofu is basically one of the best plant proteins you can find. One more reason to add it to your muscle-building menu! – Oily fish like salmon and tuna provide your body with high-quality protein and healthy fats that not only help you bulk up but also benefit your overall health. – Tilapia doesn’t contain nearly as much healthy fatty acids as salmon and other oily fish do, but it has its own admirable qualities, the most important being lots and lots of protein! – Eggs are easily the best of the best when it comes to healthy muscle-building. They combine high-quality proteins, healthy fats, and antioxidants, which makes them one of the most effective weight-gain foods out there. – Just one serving of brown rice can provide your body with the necessary amounts of carbs and calories while keeping it relatively low in fat. – Rich in protein, low in fat, affordable, and widely available – yep, it’s all about the beans! Cooked pinto, black, and kidney beans contain around 14 grams of protein per cup. – Lentils are a secret weapon you ought to have if you wanna gain weight quickly. There are 3 main lentil types: brown, green, and red. Choose the ones you like most and add them to other healthy dishes like rice, soups, and salads to double the effect. – Nuts and nut butters in particular are two more products that should definitely make it into your muscle-building meal plan. Pretty much all of them are filled with good calories, protein, and healthy fats. – Simple dried fruits like pineapples, cherries, or apples can do a good job at gaining you some muscle mass too! Despite popular opinion, fruits do not lose their nutrients when dried because their fiber content helps retain all the vitamins! – Dark chocolate can help you get toned and fit! The thing is, dark chocolate with a cocoa content of at least 70% is the ultimate source of antioxidants that boost your health and exercise performance. Hey guys, what would you choose: an avocado toast or an egg omelette? what will be a healthy dish plate? Hey bro one doubt ….walking continuesly immediately after eating is good or bad habit??!!!!! 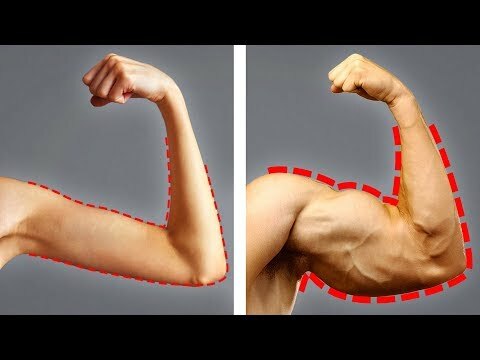 i watched video on Bright Side that said Soy is bad for building muscle so how come Tofu and Soybean are good for Muscle gain in this video???? I will use some of these foods and see the results in 60 days. is Spinach good for building muscles? Which egg should I take brown or white? In recent studies, combining banana with milk is extremely bad for the body and should not be consumed together. I think Bright side is eating Tilapia, a Filipino fish. Do tea will be good ? Adding eggs in breakfast is always great for your body. Eating spicy tofu fish is a good idea. I think BUTTER( from cow milk ) also helps in increasing the weight. I really need to lose weight tho…. What is better? Avocado or mango? I am a vegetarian and work out too. Please make a video about this topic but in a vegetarian way. Hello, I can't understand the language. Can I have Chinese subtitles? There should be a lot of people in need!